What's wrong with personal integrity? I got an unusual amount of hate mail after my post Would you bet on pro wrestling? In that post, I wrote that the Goldman Sachs affair had demonstrated that Wall Street had lost its way is in the process of destroying its own franchise of trust. Bring back the partnership investment bank. Such a structure makes the risk and return symmetric for investment bankers. If bankers want to do something stupid and foolish, then let them. However, I have found in the past that having virtually all of your net worth tied in a firm makes you think a lot more about risk control and how you make money. Require all derivative contracts to be listed on a centralized exchange. Greater transparency would create more transparency and allow market participants to better price risk. While the likes of AIG could repeat its adventure in derivatives, but greater transparency could allow the market to restrain AIG’s actions through the risk pricing mechanism. These proposals allow the market to work. Does this sound like heavy handed regulation? Unlike the Libertarians, I appreciate the role of good government and I don't regard government as evil. Good government is invisible and we don’t appreciate it until something goes wrong, much like how husbands may not appreciate their wives making them dinner every night...until there is no dinner. Government establishes a structure for the system to work. Government is the mechanism that created a system of weights and measures. It assures us that when we buy a pound of meat or a gallon of gasoline, that we get something that is indeed a pound or is a gallon. Government is a traffic cop. It compels drivers to stop at red lights and go on green lights so that there is no chaos on the roads. Similarly, it directs traffic in the skies through a system of air traffic control when we fly. We should be grateful for these invisible functions, which we never think of and take granted. These functions of government make our everyday lives easier. Already, I see the political backlash building. Respected figures, who are hardly on the fringe, are speaking out. Todd Harrison, founder of Minyanville, believes that Goldman Sachs is the poster child for class warfare. Also read Kurt Brouwer’s account of the conflicts on Wall Street and why he left Merrill Lynch. Barry Ritholz at the Big Picture is proposing a commercial in support of financial reform bill. The peasants are gathering with their pitchforks. Wall Street needs to clean up its act. Any political backlash has the potential to get out of control and the social consequences won't be pretty. In finance and in life, all you have in the end is your name and your reputation. In all of the objections that I've heard, there is one thing that I don't understand. What’s wrong with valuing personal integrity? A game changer in China? Last week I saw that an announcement of the possible phasing in of an asset based property tax that could be the beginning of a huge game changer in China and its overheated property market. First, let me explain by stating my interpretation of the macro problem in China. In the wake of the global financial crisis, China’s initial response of massive $586b stimulus program that helped to stabilize the Chinese and world economy, but created a problem by blowing an asset bubble. Chinese stimulus was directed mainly at fixed investment and created excess capacity, which will eventually end up in a bust. A better solution would have been to stimulate consumer demand, which would have better re-balanced its current account and fund flow problems, as well as dampen the trade tensions she has with her biggest customer, the United States. As a Beijing homeowner myself, I’ve experienced this puzzling phenomenon firsthand. We have been told that the value of the condo we bought last year has gone up 30% based on sales of new nearby developments, but it’s impossible to confirm since there is no secondary market. The average property tax in the U.S. is 0.95% of assessed value, which for serious real estate investors represents a relatively modest cost of doing business. But for a typical homeowner, such taxes amount to roughly 3% of their income, a not-insignificant cash outlay, especially if they are not getting full use out of the property. This and other aspects of the U.S. tax system—including the home mortgage interest deduction and passive loss rules—create strong incentives for residential property owners to either use it to live in or to generate income by renting it to others to live in, and penalize them for letting it stand idle. The effect is to keep housing prices closely tethered to real end-use demand for livable space, by driving owners to find such uses. Investor sentiment can push those prices too high or too low for a time, but the need to find actual occupants eventually forces a correction. In China, there is no cost to holding property indefinitely. In fact, it can be relatively attractive option. Unless they already possess offshore funds, Chinese citizens have limited investment choices: they can gamble on an unstable domestic stock market, buy low-yielding government bonds, or stash their cash in even lower-yielding bank deposits. By contrast, real estate—occupied or not—offers them a visibly reassuring place to park their money, sheltered from inflation. Americans have long been familiar with this advantage to owning a home, but with little or no holding costs, Chinese owners are unconstrained by the need to make the property “pay” in cash or in kind. For them, an empty condo is a store of value, much like gold, another asset that performs no practical function besides retaining its worth. A modest annual tax may not be the only factor shaping these behaviors, but it’s emblematic of an important difference in outlook. There’s an old story reported by an American journalist in Shanghai after the end of World War II. Ravaged by hyperinflation, locals had turned to using tins of sardines as an alternative currency. One recent arrival opened his “proceeds” from a sale only to find the sardines inside were spoiled. He complained to the other trader, who cried, “You opened them? My God, man! Those sardines aren’t for eating, they’re for buying and selling.” Apartments in China aren’t for living in, they’re for investing. That is the real source of demand. Consider the theory of money. Money can be anything: gold, currency, cigarettes, sardines, etc. Why not real estate? Yes, condos do deteriorate over time, but do cans of sardines. If we think about money in that framework, then much of the Chinese’s recent liquidity injections into the economy became a less liquid form of money, i.e. real estate, Let's call that M4 (= M3 + real estate held as money). If the authorities want to control the growth of M4, then they have to create disincentives to the use of real estate as a store of wealth by instituting western style asset-based property tax. Under the rules being considered, authorities would classify any purchase of third or additional property by a single family as a commercial investment, making it subject to a 1.2% annual levy on 70% to 90% of its value, according to a report Friday in the Shanghai Securities News. These are baby steps, but an asset based property tax could be create an enormous paradigm shift about how property is perceived in China. How this plays out and how long this takes to play out is anyone's guess. Would you bet on pro wrestling? I have been a longtime advocate of thinking about your assumptions before taking action or coming to a conclusion about a situation. The Goldman Sachs affair makes me take issue with the dogmatic defenders of Ayn Rand and her ideas about efficient and self-adjusting free markets. What bothers me is that the Goldman Sachs defense boils down to "buyer beware, the investors are all big boys" and "as long as it's not illegal it's ok."
I believe in the power of the free market. I believe in a strong financial sector that helps people to raise capital and get loans and invest their savings. But a free market was never meant to be a free license to take whatever you can get, however you can get it. While I agree with Obama that there is a problem, I believe that the Volcker approach favored by the White House is overly heavy handed. A better approach is this. Let me make this clear. I do believe in free markets and I do believe in the ability of free markets to efficiently allocate resources, but those principles only hold under certain conditions and assumptions. Those of us who remember the basics of microeconomics know about the elegance of supply and demand curves. Underlying the elegance of these mathematical models (and that’s all they are) are assumptions about the symmetry of information and the rationality of human behavior. Math majors all know about proof by counterexample. You can disprove an axiom if you can show a counterexample that violates it. So here are some proofs by counterexample. Goldman Sachs and others on Wall Street used to believe in getting rich slowly. You serve your clients well and you will be well rewarded in the end. To be clear, no one ever tied me down and made me buy anything, but I developed a general wariness of the Street and its practices. Even though my firm generated tons of trading business and those on the sell side were adept at acting like intermediaries, their actions were often those of adversaries. The firms (the majors especially) often knew facts I didn’t know or figured the odds better than I did. That’s not surprising, since they were full of talented, well-paid hard chargers who were placed perfectly at the center of the flow of ideas and money. I expected that to be the case. What I was slower to understand was that even as a big client they weren’t going to tell me the whole truth if it meant extra profit for them. The practice of skirting the edges of regulations, client relations, and possible conflicts of interest, so much a part of the Wall Street model of yore, needs rethinking, even at the cost of near-term profits. It simply hasn’t worked, other than to allow for outsized payoffs for the edge-pushers (until the inevitable retrenchment due to enforcement action or market failure). It’s not long-term greedy, it’s long-term stupid. Ruby Peck was my grandfather and the bond we shared is difficult to describe. He was my guiding light, my inspiration, my role model and my best friend. And it’s coming around. Wall Street may have irreparably damaged its own franchise and the resulting loss of confidence could bring the whole edifice tumbling down. While the Ayn Rand followers may rail about government regulation and the destruction of the finance industry that is essential to America, they missed the boat when they kept silent while Wall Street dismantled its own reputation. Let me put it another way. You may bet on professional boxing because you enjoy the sport and believe that the matches are fair and not fixed, but would you bet on professional wrestling? Happily, there's a ready-made and time-tested solution. Let the senior financiers keep their salaries and bonuses, and let them do with their banks what they will. If, however, their bank fails, let the bankers themselves fail. Let the value of their houses, cars, yachts, paintings, etc. be assigned to the firm's creditors. Such a proposal would have prevented many of the recent excesses that we saw on Wall Street. If the bankers want to pursue short-term profits at the price of big long-term risks, let them! To paraphrase the old adage: The prospect of being bankrupt has a way of focusing the mind. The latter requirement would bring much needed transparency for market particpants to better assess the level of risks any firm is taking. That way, market discipline would not have allowed AIG, Fannie and Freddie would not have been able to take the outsized bets that they did. My XP operating system computer has been infected with a spambot that hijacks my machine and sends out spam every four or five days. The malware goes through my Outlook Express address book and sends out spam (ten addresses per spam) and the offending emails show up in my sent items box. I ran Microsoft Network Monitor and found all sorts of internet traffic to suspect sites in Latin America, Asia and Europe when the computer was supposedly idle. If you have any suggestions please email me at cam at hbhinvestments dot com. But even education can't help in a jobless recovery. My daughter graduated from a top university last May, and like over half of her class, had no paying job waiting. [W]e note the risk that persistently high levels of public debt will drive down capital accumulation, productivity growth and long-term potential growth. Although we do not provide direct evidence of this, a recent study suggests that there may be non-linear effects of public debt on growth, with adverse output effects tending to rise as the debt/GDP ratio approaches the 100% limit (Reinhart and Rogoff (2009b)). The demographic implications of this forecast are dire for anyone who is under the age of 20 today. In economies that experience reasonable rates of growth, young people enter the work force in their 20s, acquire experience and go on to progress further in their chosen field. What happens when this age cohort has to face the stiff headwind of slow growth? Opportunities are likely to be much more limited for this generation and they are less likely to get on the first rung of the ladder in order to learn their craft. If they don’t get on the first rung, then the opportunity to progress further in their careers would be further limited. Could we see a generation of 30-somethings with nothing more than McJobs on their resume? What’s more, governments may not be brave enough initially to restrain the growth in entitlement programs, as the aging Boomer demographic represents a powerful electoral force. What happens if this under-20 cohort further has to bear the burden of paying for their parents and grandparents? Will this be the Atlas Generation, doomed like the mythical Titan Atlas to hold up the sky on his shoulders? As my wise former boss once said, "We don't make the mistakes of our parents, we make the mistakes of our grandparents." Our parents typically warn us of the problems they survived, but not those that their parents did. Thus we fall into the forgotten problem, and why big busts tend to recur about once every two generations. Is the Atlas Generation about to become the next Depression Kids? An Atlas in every basement? To be sure, not everyone who is under 20 will wind up that way. There will undoubtedly be plenty of opportunities in selected industries in the coming decades. I believe that we will see exciting breakthroughs in life extension research and nanotechnology, just to name a couple, in the coming decade. Nevertheless, the operative word is “selective”. I illustrate my point with a story from my own experience. I graduated with an undergraduate degree in Computer Science in 1980, the height of the “inflation” boom decade of the 1970’s. Computer Science grads were hot back then. Everyone in my graduating class who wanted a job got a job. Most got multiple offers. Two years later in 1982, at the height of the recession, about 2/3 of the class found jobs and some people had great difficulty. Some years later, a friend and I informally compared the career progression of the class of 1980 (my year) with the class of 1982. The class of 1982 appeared to be hobbled in their careers compared to the 1980 graduates and never really recovered from their poor start. Were we smarter than them? Or better than them? The answer is no and no. My graduating class just got a lucky break. I do fear for the under-20 generation today. They will have to work harder and fight harder for fewer rewards than we did. Some will return as adults to live in their parents’ and grandparents’ basements despite their innate talent, ingenuity and efforts. Baby Boomers and Generation X parents should form their financial plans accordingly. Deficient Aggregate Demand Is Key. The high unemployment that the United States is experiencing reflects a severe shortfall of aggregate demand. Despite three quarters of growth, real GDP is approximately 6 percent below its trend path. Unemployment is high fundamentally because the economy is producing dramatically below its capacity. That is, far from being "the new normal," it is “the old cyclical." In short, in my view the overwhelming weight of the evidence is that the current very high -- and very disturbing -- levels of overall and long-term unemployment are not a separate, structural problem, but largely a cyclical one. It reflects the fact that we are still feeling the effects of the collapse of demand caused by the crisis. Indeed, at one point I had tentatively titled my talk "It’s Aggregate Demand, Stupid"; but my chief of staff suggested that I find something a tad more dignified. The sensible way to address the deficit is with a long-run plan. It would be penny-wise but pound-foolish to try to deal with our long-run problem by tightening fiscal policy immediately or foregoing additional emergency spending to reduce unemployment. Immediate fiscal contraction would inevitably nip the nascent economic recovery in the bud -- just as fiscal and monetary contraction in 1936 and 1937 led to a second severe recession before the recovery from the Great Depression was complete. And nothing would be more damaging to our fiscal future than a protracted recession and permanently higher unemployment. But, a credible, comprehensive plan for deficit reduction would create a favorable climate for investment and ensure that the economy remains strong. The Obama White House appears to have embraced the solutions advocated by Richard Koo , Chief Economist of Nomura Research Institute, whose prescriptions are to spend until it hurts and then spend some more. That's Keynesianism squared. With the Federal Reserve leaning accommodative, this policy choice is very risky and could spark off an inflationary cycle that runs out of control. The BIS recently issued a report that concluded that all roads lead to inflation. My Inflation-Deflation Timer model has already moved to an inflation reading. Investors should be prepared accordingly. Time to be fearful yet? The latest BofA Merrill Lynch Fund Manager Survey (via FT Alphaville) shows institutional investors have now gone “all-in” on the V-shaped recovery trade. Individual investors seem to be coming back into the stock market and sentiment measures appear to be at a bullish extreme again. Sentiment Trader (via ZeroHedge), pointed out that Nasdaq TICK almost passed an all time high and equity-only Put/Call ratio dropped to 0.32, the lowest reading since January 16, 2004. What's more, the ISEE Sentiment Index is showing an off-the-charts bullish reading. There are indications that investors are overly optimistic going into this Earnings Season and therefore earnings disappointments are just around the corner. FT Alphaville also highlighted the rise of Paragon, a buy-to-let mortgage lender, which relies on the wholesale and securitisation markets to do its business (The return of the “other” Northern Rock). 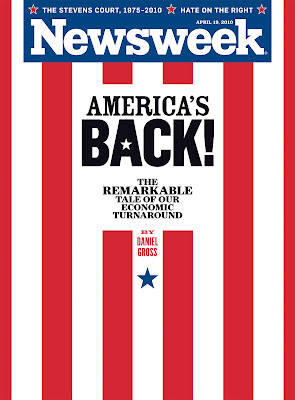 Paul Kedrosky highlights the Newsweek cover as a contrarian indicator. Warren Buffett has famously said, “Be fearful when others are greedy and greedy when others are fearful”. Is it time to be fearful yet? I believe that the market is in a fragile state, but that's the equivalent of riding around on a motorcycle at 100mph without a helmet on. It doesn't necessarily mean that you get hurt. It just means that if you hit a bump in the road the damage will be very, very bad. My inner investor is therefore a blubbering nervous wreck. The Goldman Sachs news Friday is a typical "bump in the road". It remains to be seen what kind of damage it causes to market psychology and whether Goldman's failure to disclose the receipt of a Wells Notice is the beginning of a death spiral for the investment bank (or the market). My inner trader, on the other hand, tells me to stay with the positive momentum for now, watch for technical breaks and maintain very tight stops. I recently pointed out that real-time indicators are showing that the economy is rebounding. As the markets have rallied from the reflation trade, my inflation-deflation timer model moved from a "neutral" reading to an "inflation" reading last week, which would move the model portfolio from equities to a basket of commodities (see report here). The model appears to be in good company as I see that Ken Heebner has also put on an inflation bet in his portfolio. Heebner is a portfolio manager with a terrific long term record (though he has struggled in the last couple of years). He has a "swing for the fences" style and tends to make big top-down bets. Long commodities, short bonds and interest sensitives - that sounds like a commodity inflation bet to me. If you are around in Boston next Tuesday April 20, 2010, at 6:15, Mark Kirtzman is presenting a fascinating paper on how to measure financial system fragility at the QWAFAFEW (Quantitative Work Alliance For Applied Finance, Economics and Wisdom) meeting. Mark Kritzman is the President and CEO of Windham Capital Management, LLC, Senior Partner of State Street Associates, and teaches a financial engineering course at MIT's Sloan School. The U. S. government’s failure to provide oversight and prudent regulation of the financial markets, together with excessive risk taking by some financial institutions, pushed the world financial system to the brink of systemic failure in 2008. As a consequence of this near catastrophe, both regulators and investors have become keenly interested in developing tools for monitoring systemic risk. But this is easier said than done. Securitization, private transacting, and “flexible” accounting prevent us from directly observing the many explicit linkages of financial institutions. As an alternative, we introduce a measure of implied systemic risk called the absorption ratio, which equals the fraction of the total variance of a set of asset returns explained or “absorbed” by a fixed number of eigenvectors. The absorption ratio captures the extent to which markets are unified or tightly coupled. When markets are tightly coupled, they become more fragile in the sense that negative shocks propagate more quickly and broadly than when markets are loosely linked. 1 Most significant U.S. stock market drawdowns were preceded by spikes in the absorption ratio. 2 Stock prices, on average, depreciated significantly following spikes in the absorption ratio and, on average, appreciated significantly in the wake of sharp declines in the absorption ratio. 3 The absorption ratio was a leading indicator of the U.S. housing market bubble. 4 The absorption ratio systematically rose in advance of market turbulence. 5 Shifts in the absorption ratio coincided with major global financial crises and tracked changes in independent measures of contagion. Based on the above chart, we appear to still be in a very fragile state. The meeting is at 6:15 at 3rd Floor of the Tennis & Racquet Club, 939 Boylston Street. Boston, MA. RSVP responses to Hugh at QWAFAFEW dot org (note spam protected email address). Is America becoming like China? I have written before that America is becoming like Argentina. Disturbing characteristics such as the emergence of a social elite, combined with low class mobility combined to drive Argentina from a promising emerging market economy that was on par with countries like the United States a century ago to the long road to stagnation that we have seen today. Unfortunately, there are signs that America is not only going down the road to Argentina, but also adopting the worse social practices seen in China. 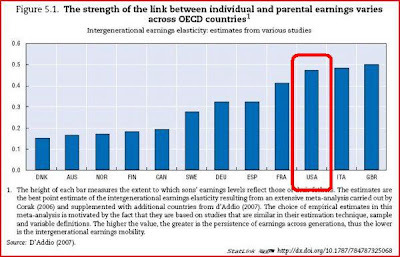 I had previously posted the results of an OECD study that showed low social mobility in the US, as defined by the correlation of the Gini coefficient of parent and offspring, compared to more “egalitarian” countries like Denmark and Norway. 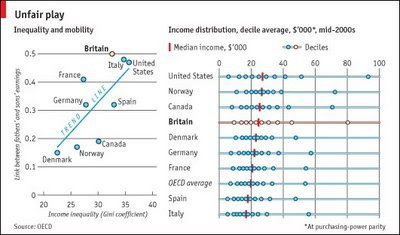 High Gini coefficients combined with low social mobility indicates that elites are entrenched and the American Dream is only a dream. 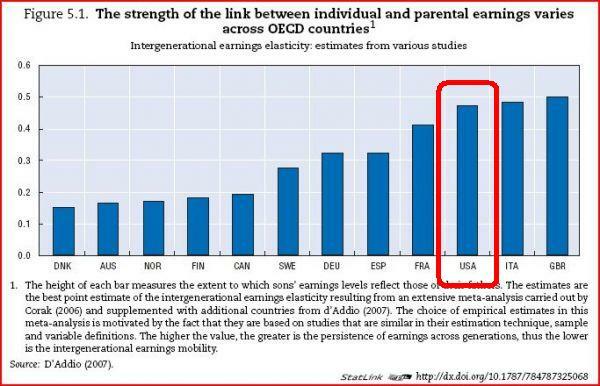 Now an updated OECD study reiterates those results about income persistence across generations. In America, rich kids tend do better than poor kids compared to most other countries. Parents can affect their descendants’ labour market outcomes in different ways. One runs through labour productivity, which is often affected by schooling choices, parents’ private investment in education outside the educational system and individuals’ own investment in higher education. The extent to which productivity is then reflected in wages is influenced by labour market institutions, which vary across countries. Parents can also affect the success and integration in the labour market in more indirect ways, such as through the transmission of social norms, work ethics or social networks. The main reason for the observed inequality is education. Wealthier families in America are in a better position to invest more in their children’s education compared to other income groups. 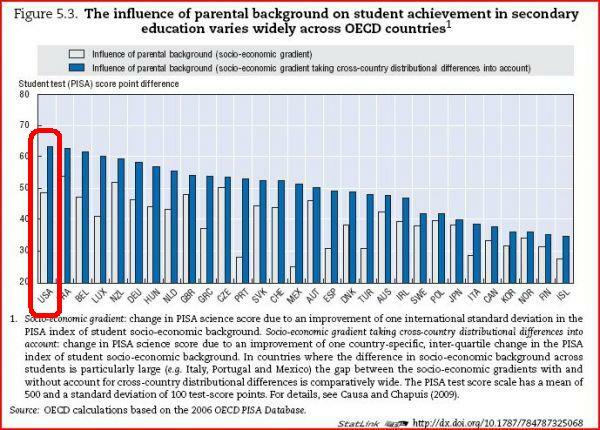 The chart below shows the influence of parental background on their children’s education, before (white bar) and after (blue bar) adjustments for socioeconomic class. 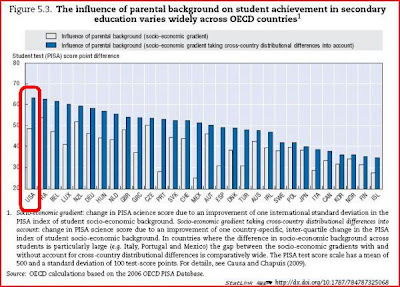 The system in America is showing a definite “class” effect in achievement. The result of all this inequality has morphed into an “Olympics” in income distribution (if you aren’t a gold medalist, you are nothing.) Emmanuel Saez of Berkeley documents the division of the spoils in the top 10% of the income distribution in the United States. 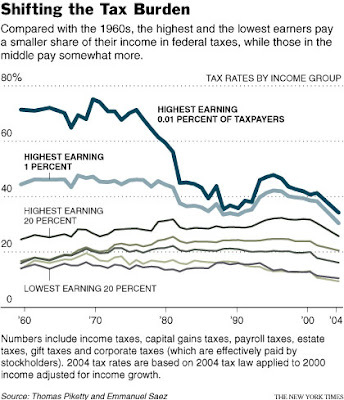 Most of the gains in the past few decades have accrued to the top 1%. Being in the top 10% doesn’t cut it anymore as those groups saw little or no relative gain. You need to be in the top 1% - the real elite. 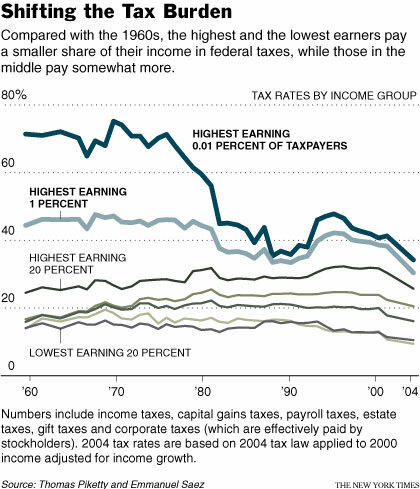 In addition, David Leonhardt highlighted the fact that policymakers have lowered the tax rates for the super-rich since the 1970's. The Communist Party has enjoyed enormous success in turning China into a powerful nation and lifting its citizens out of poverty. But the party is also a club that allocates political, financial and social privilege to its members. It has its own internal system of hierarchy and quasi-royalty, where revolutionary leaders bequeath their status to their children and children's children. Those descendants are called "princelings" in China. Many of the elite’s children are western educated and, over the past 15 years, dozens have been recruited by western companies and banks hoping to secure an entry into the Chinese market and win mandates to take state-owned companies public in New York or Hong Kong. As most foreign investors know, employing the relative of a senior party leader as an adviser or employee can help cut through bureaucratic obstruction and resistance from local interest groups. A China analyst once told me privately that the popular perception is that the Communist Party elite controls 80% of the economy and the rest of the population 20%. Already there is a fair amount of resentment among the populace over this state of affairs. If China continues to grow at its breakneck pace, there is plenty of new wealth to go around and tensions are likely to be contained. Should growth slow for any reason, the political backlash would be terrible. Under the current system, China watcher Michael Pettis believes that it is the Chinese middle class that will pay for the bad loans should growth falter. He believes that the current asset bubble in China is a tax on the Chinese middle class, as the property bubble acts as a “tax” on savings that gets funneled to the business elite by penalizing savers in order to cheaply fund the builders of infrastructure. To strengthen China’s position in the coming conflict with the United States, taming the land bubble is a must...China’s main challenges are internal. How to divide the pie created by economic development is critical to the country’s future. Many argue growth will solve all problems. I’m not sure about that. Asset bubbles in China are mainly for taxing the middle class, and they stunt growth. No modern economy can be stable without a big, healthy middle class. As long as China’s middle class is vibrant and growing, external challenges cannot derail economic development. So the answer to China’s problems lies within. International confrontation offers no solutions. The stability of a modern society depends on its middle class being in the majority and content with its situation. The high land-price policy is a form of tax on the middle class, which will slow its growth. China may become a country with a small group of the super-rich, a vast lower class with no property, and a small middle class. Such a social structure would not be good for long-term stability. In other words, trouble could brew in China if the authorities don’t keep the growth machine going. Political stability rests with the middle class, just as it does in America. When we look across the Pacific, we can see the landmines beneath the surface. Can the America psyche its social consensus and social contract in time to avoid the China/Argentina trap? Or does all this spell the decline of the American Empire? Last week Stephen G Cecchetti (Head of the BIS Monetary and Economic Department), M S Mohanty (Head of BIS Monetary and Economic Department) and Fabrizio Zampolli (Senior Economist) of the Bank for International Settlements, released a working paper entitled The future of public debt: prospects and implications. The paper paints a terrifying prospect for the inhabitants of most of the developed world. The chart below shows the projected debt to GDP ratios of Europe, Japan and the United States for the next 30 years. The red dotted line depicts the baseline scenario, which assumes that assume that government total revenue and non-age-related primary spending remain a constant percentage of GDP at the 2011 OECD projected levels. The green line assumes budget cuts of 1% of GDP for five years starting in 2012. The blue line assumes deeper cuts to entitlement programs, e.g. pension benefits, etc. Even more worrying is the fact that most of the projected deficits are structural rather than cyclical in nature. So, in the absence of immediate corrective action, we can expect these deficits to persist even during the cyclical recovery. Under the baseline scenario, deficits spiral out of control for every western industrialized country under study. What is more depressing about this study is that, regardless of the level of budget cuts (with or without cuts to promises made about entitlement programs), debt to GDP continue to skyrocket for the major industrialized countries of Japan, UK and US. When the public reaches its limit and is no longer willing to hold public debt, the government would have to resort to monetisation. The result, consistent with the quantity theory of money, is inflation. And anticipation that this will happen may also lead to an increase in inflation today as investors reassess the risk from holding money and government bonds. In such an environment, fighting rising inflation by tightening monetary policy would not work, as an increase in interest rates would lead to higher interest payments on public debt, leading to higher debt, bringing the likely time of monetisation even closer. Thus, in the absence of fiscal tightening, monetary policy may ultimately become impotent to control inflation, regardless of the fighting credentials of the central bank. [B]ond traders are notoriously short-sighted, assuming they can get out before the storm hits: their time horizons are days or weeks, not years or decades. We take a longer and less benign view of current developments, arguing that the aftermath of the financial crisis is poised to bring a simmering fiscal problem in industrial economies to boiling point. In the face of rapidly ageing populations, for many countries the path of pre-crisis future revenues was insufficient to finance promised expenditure. We doubt that the current crisis will be typical in its impact on deficits and debt. The reason is that, in many countries, employment and growth are unlikely to return to their pre-crisis levels in the foreseeable future. As a result, unemployment and other benefits will need to be paid for several years, and high levels of public investment might also have to be maintained. The US national debt is now over $11 trillion dollars. The interest on our national debt is now $340 billion. This is about at 3.04% rate of interest. In ten years the Obama administration admits that they will add $9 trillion to the national debt. That would take it to $20 trillion. Let's say that by some miracle the interest on the national debt in 10 years will still be 3.04%. That would mean that the interest on the national debt would be $618 billion a year or over one billion a day. No nation can hold up in the face of those kinds of expenses. Either the dollar would collapse or interest rates would go through the roof. The basic picture of the federal government you should have in mind is that it’s essentially a huge insurance company with an army; Social Security, Medicare, Medicaid — all of which spend the great bulk of their funds on making payments, not on administration — plus defense are the big items. Is it time to “buy” inflation? The authors of the BIS working paper believes that all roads lead to inflation. I concur with that view and inflation hedge vehicles such as hard assets, commodities and shares of commodity producers have their place in a portfolio. However, I have also expressed the belief that any commodity bull is likely to experience a high degree of volatility. Here is the dilemma. Global economies are currently mired in a fragile slow-growth environment, but, as inflation could break out at any time. Investment hedges that perform well in a runaway inflationary environment will do poorly in a recessionary period and vice versa. You can get the picture right and get hurt really badly in the interim. Consider the chart below showing the monthly price of gold during the 1970’s. Even though the yellow metal rocketed from $35 in the early 1970's to $850 in January 1980, investors would have suffered a correction of 43% - and that’s based on monthly prices. The peak-to trough correction in gold would have been even more using daily pricing. The world faces a high degree of uncertainty about policy direction, which would result in gut-wrenching intermediate term market volatility. Consequently, I am operating with a base case scenario of several episodes of volatility with draw-downs of 50% or more in a multi-decade long secular commodity bull. Investors who don’t have that level of tolerance for those kinds of losses need the necessary tools to be able to navigate these ups and downs. Philip J. Klotzbach and William M. Gray of the Tropical Meteorology Project at the Colorado State University has issued a new 2010 forecast and it calls for a higher than average hurricane season. Highlights include 8 hurricanes (vs. an average of 5.9 for the 1950-2000 period), 15 named storms (vs. 9.6) and 4 intense hurricanes (vs. 2.3). More storms will mean higher energy prices and greater price volatility later this year. The economy appears to be rebounding from a very nasty recession which was induced by a credit crisis. Unfortunately, a lot of people don’t seem to have learned their lesson and they are behaving like 16 year olds again. Otherwise, what else should we make of these developments? The Wall Street Journal reports that covenant-lite loans are making a comeback. Junk bonds resurgent: Companies sold $54.3 billion in U.S. high-yield debt during the first quarter of the year, according to Dealogic, up from $9.6 billion a year ago. Bloomberg reports that the house flipper is back, or vulture investors looking to buy and flip distressed properties. Mebane Faber highlighted last week that Schwab is advertising its low margin rates. From FT Alphaville: “displaced credit experts” have shifted their focus away from CDOs and other structured products to emerging markets in South America and Asia. Is it time to put on the risk trade or are these Signs of the Apocalypse? There is a great video showing a debate between Jim Grant, who recently “downgraded” his credit rating of US government debt, against David Rosenberg, bond bull. Grant’s case was that the overwhelming fiscal pressures on the US government would lead to a credit downgrade, which would be bearish for the US Dollar and bullish for the commodity inflation outlook. Rosenberg’s contention was that we went through a recession that was induced by a credit induced contraction, which is different from your post WW II garden variety inventory recession. Credit contractions take much longer to resolve and are inherently deflationary. In such cases, investors are much more interested in the return of capital (safety) than return on capital (greed), which is bullish for default-free assets such as US Treasuries. In my opinion, they both are. They just differ on time horizon. Jim Grant is correct that these pressures are ultimately negative for the USD and the creditworthiness of the US government paper. I believe that Grant is right in the long run (5-10 years), as is Bill Gross, who recently turned long-term bearish on bonds. David Rosenberg, by contrast, is a former brokerage firm analyst and more attuned to the markets. I believe that Rosenberg is right in the intermediate term (1-2 years). We are likely to see a double-dip recession (see my previous comments on the risks here and here). If you believe Grant, as I am, you are likely to gravitate towards being a long-term commodity bull. OECD governments are all pursuing similar policies of stimulus, which amount to competitive devaluation. Pressures on the USD are therefore unlikely to show up in the currency markets, but more likely to manifest themselves in commodity prices. That’s why I am a long-term commodity bull. My inner trader, on the other hand, understands that we live in an extremely volatile environment, which I have characterized as Extremistan, or Minskyville. I reiterate my comment that macro-economic volatility has skyrocketed to levels last seen in the 1960’s and 1970’s. Unfortunately, most investment managers alive today weren’t in the business back them and may not be mentally prepared to deal with the new old era of heightened volatility. ECRI did some analysis on the US economy that came to similar conclusions about the rising economic volatility. ECRI believes that the era of the Great Moderation, policies used by Greenspan et al to dampen volatility, is over. Under such circumstances, relapses back into recession are very likely and investors have to be prepared accordingly. Consider the chart below showing the monthly price of gold during the 1970’s. Even though the yellow metal rocketed from $35 to $850 in January 1980, investors would have suffered a correction of 43% - and that’s based on monthly prices. The peak-to-trough correction in gold would have been even more using daily pricing! What kind of investor would have been willing to withstand this kind of volatility? Today, the economic backdrop is extremely fragile. While Grant may be right about the long term trajectory of Treasuries, we could go through several jaw dropping and heart attack inducing up-and-down cycles over next decade. Even though I am a long-term commodity bull, I also understand that we need the proper tools to be able to properly navigate any potential ups-and-downs. Dave Frost at Oilprice recently observed that there appears to be positive turnarounds in a variety of economic indicators. Moreover, job postings are rising across the board in all industries. State taxes are on the rebound. As well, ISM manufacturing data also appears to be robust. 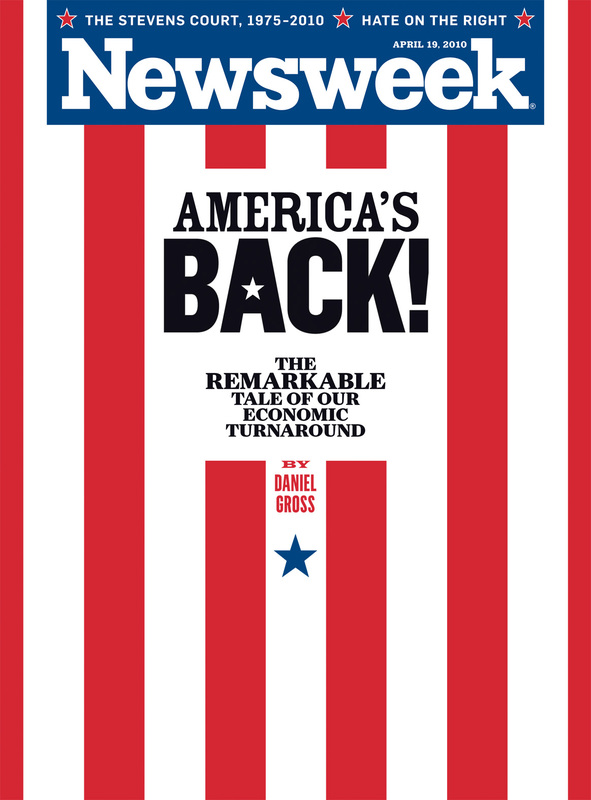 Is the US economic rebound poised for another upleg? Instead of trying to analyze backward looking economic releases, I prefer to look at the market’s response, which are more forward looking and the signals are available in real-time. Consider the US non-farm payroll release Friday. Robert Hall at NBER believes that the NFP release makes it clear that the recession is over, the bond market agreed with Hall by selling off, which is often an indication of a stronger economy. Commodity prices are on the rise. The chart below of the Reuters/Jeffries CRB Index shows that it is testing a resistance level. My Inflation-Deflation Timer model, which is currently in neutral, is flirting with an “inflation” reading which would shift asset allocation from stocks to commodities. Sound the "all clear" for the stock market? What do these positive economic indicators mean for equities? Would a new upleg in the economy mean another upleg in stocks? The upside breakout in bond yields can’t be good for stocks longer term. Jim Grant is downgrading the US credit rating and therefore forecasting US rates to rise, mainly because of negative assessment of credit risk. Grant went on to characterize Treasuries as warrants on a macro-economic outcome and quipped that you will find better bargain in your hotel minibar than in Treasuries. Bespoke’s report of stocks over the 50-day moving average indicates the market is overbought (which doesn’t mean that it can’t stay overbought for some time). The ECRI Weekly Leading Indicator seems to be rolling over and there are indications that it may be negative for stock prices. I have also expressed my reservations about the impending macro-economic risks (see comments here and here). When does good news become bad news? For now, good news is good news for stocks, i.e. good economic news makes stocks go up. At some point, good news becomes bad news because of the fear that the Fed may use positive economic news as a reason to remove accommodation. The Federal Reserve is walking a fine line in its behavior. The world just went through a financial crisis of gargantuan proportions. The fiscal and monetary authorities decided to stimulate the economy in response. But stimulate too much and you get runaway inflation. Stimulate too little and you will keel over back into recession. You just have to get the stimulus just right - and can we count on the Fed and the US government to do that in such a fragile environment? My inner trader tells me to stay with the trend, but to watch for technical divergences and shifts in sentiment. The first quarter of 2010 is over and it's time for a report card on the Inflation-Deflation Timer model. The table below shows the performance of the model ending March 31, 2010. Returns for the first quarter came in at 2.4%, which is slightly ahead of the 60% stock/40% bond benchmark. Longer term returns were more encouraging. The returns of the model were significantly ahead of benchmark for all longer period time frames of 1, 3, 5 years and from the inception date of December 31, 2000. This model is designed to perform roughly in line with a 60/40 balanced fund benchmark during normal times, but outperform during period of market stress. I am pleased that with the latest figures which indicate that the model appears to be performing as designed.